Brooklyn's Smorgasburg flea market has opened their restaurant 180 Tenth in the High Line Hotel. Smorgasburg – Brooklyn’s beloved outdoor food and flea market – is consistently the spot to find the newest in food trends: This year you’ll be able to find spaghetti doughnuts, churro ice cream sandwiches, and dragon fruit juice among their vendors. Since 2011, the allure of delicious, and often innovative, food has been driving hoards of hungry New Yorkers (and curious tourists) to their stalls. Now it’s time for their next move. Smorgasburg’s co-creators, Jonathan Butler and Eric Demby, have partnered with the High Line Hotel in West Chelsea to create a dining experience you might not expect from a venue that specializes in food small enough to fit in your hand or on a paper plate, best enjoyed while strolling around a water front park: Their first ever brick and mortar restaurant. 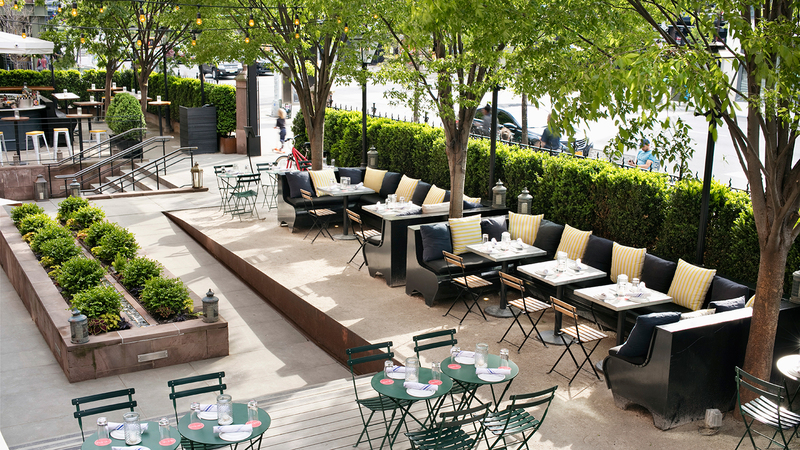 180 Tenth by Smorgasburg is an outdoor restaurant in the High Line Hotel's front courtyard and garden. 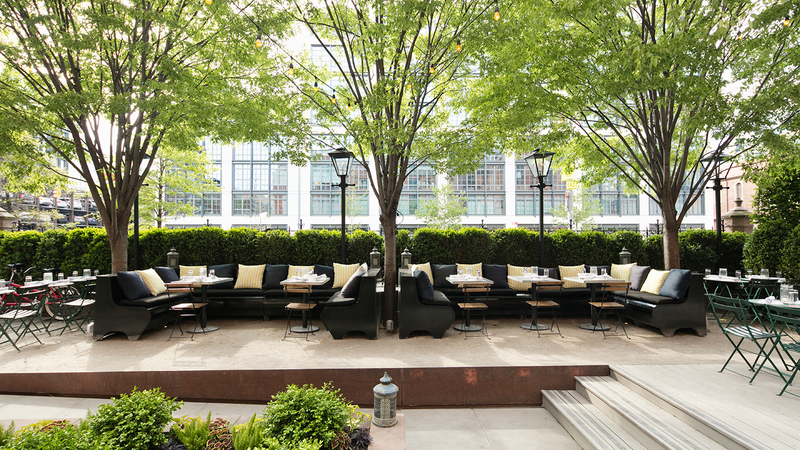 The garden restaurant at the High Line has been in operation for four years; this will be 180 Tenth by Smorgasburg’s first season partnering with the hotel. Butler and Demby teamed up with chef Aaron Taber to create a dining experience centered around summer’s best ingredients. To that end, the menu is simple and light, focusing on oysters and “snacks,” like olives with fennel marmalade, a burrata and tomato salad, and of course fries with aioli, while the small selection of larger plates focus on vegetables. You won’t be surprised to find a kale salad on the menu, but there’s also a veggie burger made with quinoa, walnuts, and mushrooms offered. To create the drink menu, Butler and Demby brought in another disciple of food market-style dining: General manager of Berg’n for the last three years, Jen Watson. She helped picked the restaurant’s selection of natural wines and craft beers, and helped concoct their truly scrumptious sounding cocktails like a frozen Negroni, and the High Line Bling, a glass of a champagne accompanied by an oyster shooter. One thing the original Smorgasburg and the new restaurant have in common? You’ll be dining in the open air, which means you'll only have the summer months to enjoy both the market and the restaurant. Just don't expect any doughnuts made from pasta at the High Line.